Vinalhaven's Carver's Harbor is frozen solid. Six sloop boats ( Friendship sloops) are locked in the ice along with a couple of the new power lobsterboats. The sloop boat in the foreground has a lobster trap hauler so it has an auxiliary engine. In the background is the lighthouse tender Zizania which brought a small amount of supplies to the island which had been icebound for a week or more. 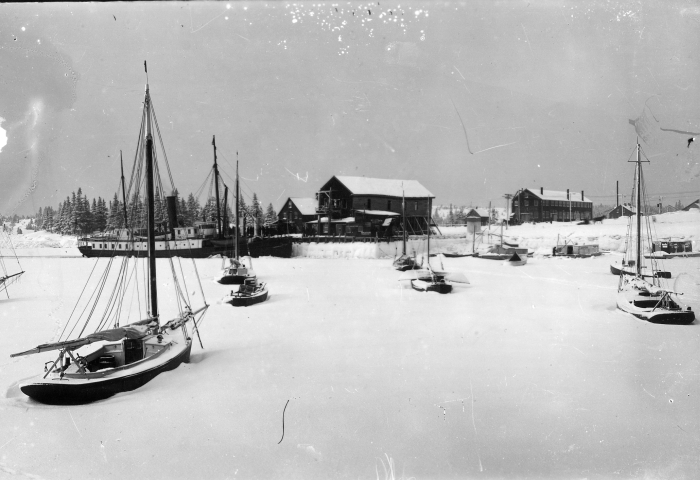 After a telegram to President Wilson, the oceangoing tug Favorite brought in substantial amounts of food for people and animals as well as islanders who were stranded on the mainland, breaking the ice blockade.